Bottled beverages, whether it’s drinking water or soft drinks, always start with clean, pure water. Because of variability in the taste of municipal drinking water, bottling plants treat water on-site to ensure quality of the final product. All water is disinfected prior to contact with plant equipment, and the equipment itself is disinfected. The water may be sent to a series of advanced treatment processes before being used for beverage production. Finally, bottling preserves the product quality until the beverage its opened by the consumer and ready for enjoyment. Chlorine disinfection is a common and cost effective disinfection method. While chlorine fully disinfects via oxidation, it also leaves a residual. In municipal drinking water plants, a chlorine residual is desirable because it continues to disinfect water as it travels through the distribution system. However, bottling companies don’t want to alter the taste of their products and bottling preserves the purity of beverages after disinfection. Activated carbon is applied to remove the chlorine residual. Chlorine is also incompatible with reverse osmosis units and water must be dechlorinated ahead of reverse osmosis. Reverse osmosis is used to achieve high removal of total dissolved solids. Ultrafiltration membranes, which are less sensitive to chlorine, are often sufficient for water treatment and pathogen removal since ultrafiltration can reject 90% of pathogens. Activated carbon can be applied to remove dissolved gas and other contaminants that are not captured by the filter, and several rounds of disinfection ensures complete pathogen removal. An alternative to chlorine disinfection is ultraviolet disinfection. UV disinfection does not leave a residual and impart flavor to the finished water. UV disinfects by inactivating pathogens and preventing reproduction and growth, unlike chlorine which kills pathogens outright. 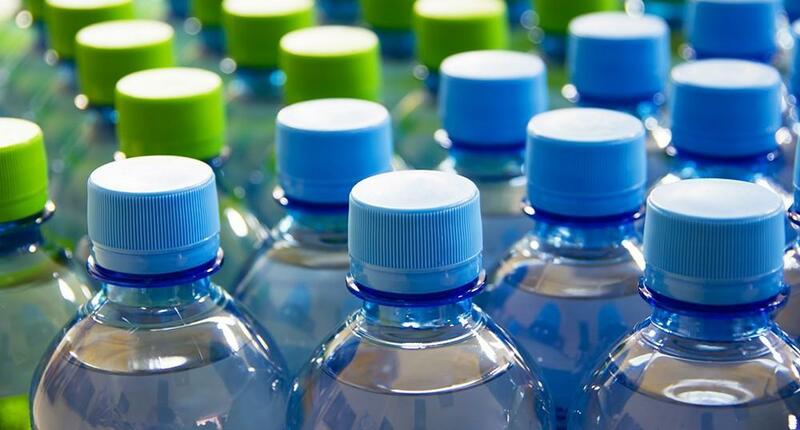 UV is becoming a cost effective and preferred method of disinfection in bottling plants. To maximize cost effectiveness, UV is applied after activated carbon which removes organic compounds that can reduce the efficiency of UV disinfection. UV can also be used to remove ozone residual from equipment that is sterilized with ozone. As a disinfectant, ozone can treat both equipment and water, but it is costlier than chlorine so it is not a preferred alternative for water treatment. Lastly, UV is also used for pre-treatment ahead of reverse osmosis units to prevent biofouling. One important benefit of UV disinfection over chlorine or ozone disinfection is the lack of residual. UV disinfection or a combination of ozone and UV disinfection can be used to sterilize finished products without altering the product taste. One important example is the bottling of mineral water. On the one hand, minimal processing is desired to maintain the original flavor of the natural water. On the other hand, sterilization is necessary to provide a safe product to the consumer. Additionally, the use of ozone to disinfect mineral water carries the risk of producing brominated disinfection by-products. The effectiveness of UV is determined by the energy of the lamp and the transmittance of the product. In the case of disinfecting reverse osmosis product, the transmittance is 100%, but in the case of treating natural waters or finished products, the transmittance will be reduced. Bottled products with extremely high total dissolved solids such as syrups can also be disinfected with UV once transmittance is considered.